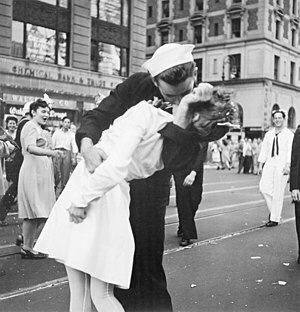 Public Art: Unconditional Surrender aka The Kiss! Yesterday, we featured Stanley Blefield’s “Homecoming” statue that captured the joyous reunion of a family. Today, we are featuring another piece titled “Unconditional Surrender” by J. Seward Johnson that is now on-loan to the Port of San Diego. 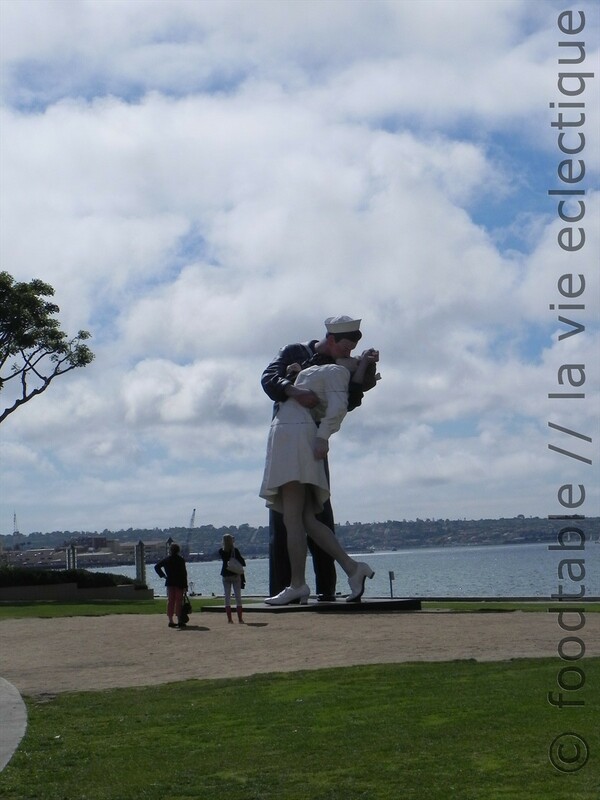 This 25-foot statue is based on the above famous black & white photograph of a sailor kissing a nurse in Time Square, New York in 1945 when it was announced that World War II has just ended. It was one of those unforgettable photographs capturing a spontaneous and joyful moment. Imagine that after all those years at war that you are finally told that it was over. Finally, we have peace. Wouldn’t you want to grab someone close by and plant a big KISS on them? 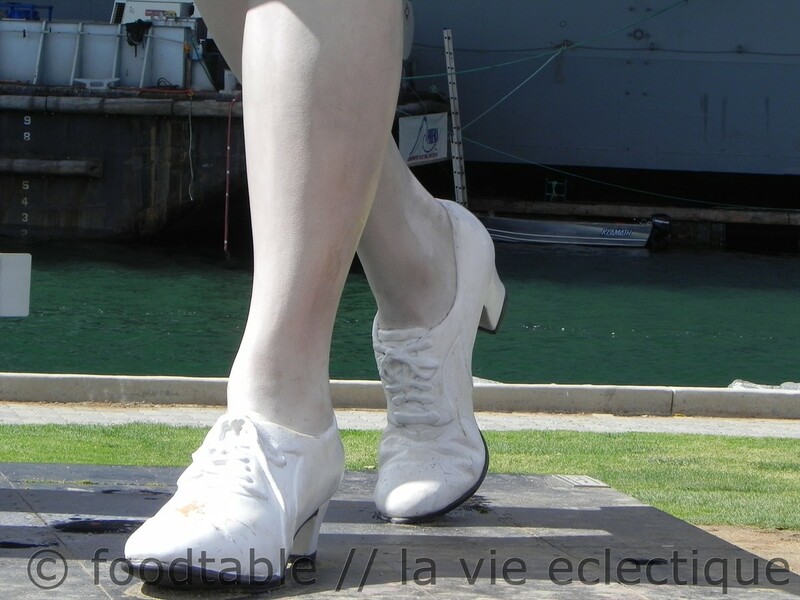 This statue epitomize that spontaneous moment. To me, this sculpture also shows that peace is so fragile that we should all try to preserve and celebrate it when we can. 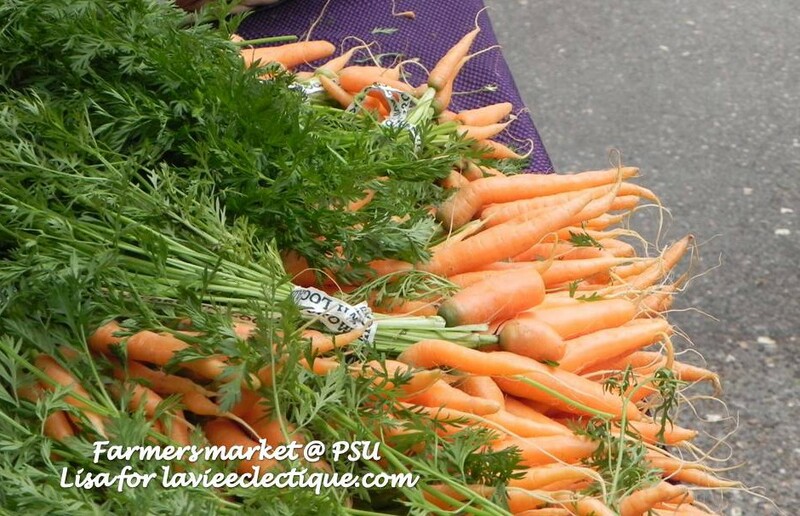 As photographs go, I took this in many different angles and picked these to show here. I haven’t seen such a big sculpture before this one, so it took me by surprise. How do you photograph something that’s literally many times bigger than life? So I try to photograph the smaller details like their shoes. And to show the contrast of how these people must have felt at that time by how they stood. One pair solidly on the ground, and the other, taken by surprise, with a foot slightly off the ground. A young man sweeping the young girl off her feet… Quite literally…quite romantic. Hi ccu. 🙂 Yes, it is romantic, isn’t it? That’s probably why they want to have it there permanently. I didn’t swoon (ha ha, love your word there) but I did have an urge to kiss someone. Luckily, someone was beside me. 😉 It was quite lovely. Cheers to you also. I love this statute too…Took lots of pic of when when I was down in San Diego last time. You are correct. It is gigantic.